This word shapes puzzle for Mother's Day supports spelling practise, vocabulary building skills and growth of early learning skills for reading and writing. 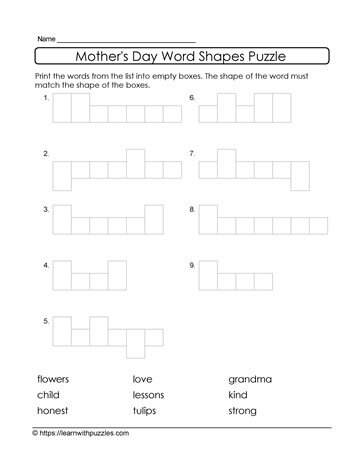 To solve the puzzle, solvers must print the list of Mother's Day words, in the word bank, in the correct place, directed by the blank letter shapes in the puzzle. For example, question 9 word is, love.